PEANUT. May contain traces of NUTS. 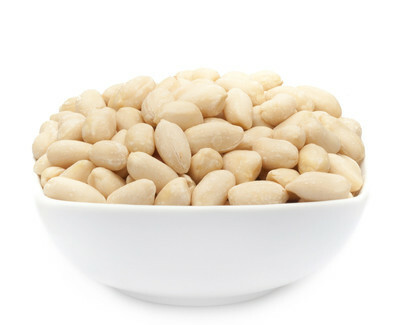 Very few people might know that the popular Peanuts actually are not nuts in the traditional sense, but rather belong to a kind of leguminous crops, such as peas and beans. A special feature of the peanut is also that is one of the few leguminous crops that can be consumed raw. It owes its name ?Peanut? to the fact that it doesn't grow as normal as a nut on a tree or a bush, but actually is ripened under the earth in a separate pericarp to harvest. This circumstance makes it already a little revolutionary and, therefore, something very special, our PEANUTS PURE are devoid of any spice, are peeled and thus a completely natural peanut snack, which can be used in between for a variety of cooking, or simply as a cleaner snack. As opposed to their conspecifics, which are roasted in fat, flavoured with salt or other spices, are PEANUTS PURE, genuine peanut pleasure - no flavour enhancers or other additives. Fresh peeled from the hard woody envelope and freed from the fine brown fruit skin, they are also without any concomitant a nutty snack full of peanut flavour. PEANUTS PURE saturate excellent due to its natural fat content and can counteract cardiovascular diseases. All around a good and delicious nut snack, which should necessarily have a place in your healthy diet. Fortunately, you can buy from us online your peanuts. The follower of a modern, healthy lifestyle, for example, vegans, vegetarian or Clean Eating are thrilled by the natural phenomenon of our PEANUTS PURE. The annoying peeling and disposal of the fruit shell and the parchment-like brown fruit skin, have you already taken. The unadulterated nibble is now no further an obstacle. We have completely dispensed with these nuts on the addition of any spices to offer you the absolutely pure food that you can mix, depending on the whim of other nuts or fruits, but also offers a great alternative to chips or highly processed crackers.